Well friends… It is the week before Easter, and I am slightly inspired by all these pictures of cute little kiddos with the Easter Bunny. Okay… actually I am frightened by the creepy Easter Bunny, but the pictures and this time of the year in general always get me thinking about nurseries… Is that weird? I love LOVE LOVEEEE nursery design. Really any type of design for kiddos. It’s so much fun because you have to be practical but you can also be whimsical! So I had an idea for all of you and decided to design 4 different takes on a bunny inspired nursery. Before we “hop” in to the 4 different designs (sorry… sometimes my Dad’s “Dad jokes” rub off on me) I thought I could also address the important difference between themed nurseries and inspired nursery design. There is absolutely nothing wrong with a themed nursery. If you know what you want, then by all means DO IT! If you have an idea of something you were wanting to incorporate and are at a crossroads of whether to take it and run with it and implement it in every square inch of your space, let me see if I can guide you in a different direction. Inspired nursery design is taking something very important to you or some type of underlying theme you were wanting to incorporate and making it more a focal point by using it sparingly. So If you wanted to have a nursery with bunnies in it, think about just a cute nursery with an over-sized bunny print or a cute bunny wallpaper on one wall. 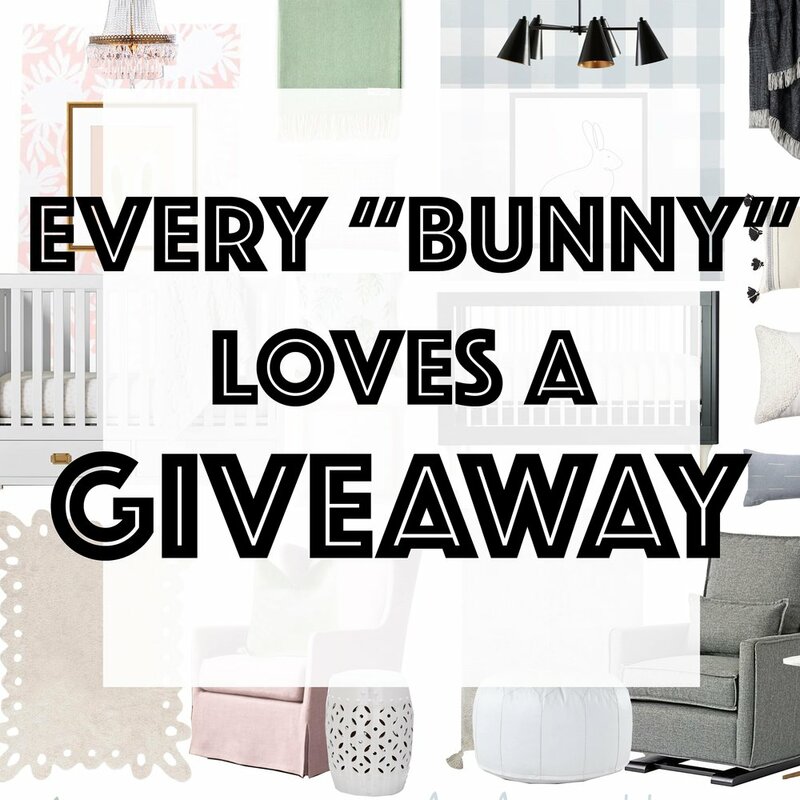 To help you understand what I am talking about, check out these 4 fun different takes on a bunny inspired nursery. I have also included clickable links so you can check out some of these products or discover some of my go to source sites for clients! If you loved this and feel like you could use help with your own child’s room, I am so excited to announce that I am officially offering children’s e-design as a part of Cait Waite Designs! I stopped doing them for a while, but I am bringing them back! Let me and my design associate help you tailor a space perfect for you! Email us today at caitlynwaite@gmail.com if you are interested! Room design packages are $500 and include a board like above, a shopping list, and a floor-plan to show you where we would lay everything out in your space. All you have to do is give us a budget, dimensions of your space and any pieces of furniture you want us to use, and send us some before photos! Because I am so excited about offering this service now, I am partnering up with Mandy and offering one lucky winner a FREE E-design board completely customized for you and your space! That’s a FREE $500 value! Two | Find the photo below on the Caitwaite Instagram feed and like it! Three | Tag 3 friends you think would also like to know about this giveaway!